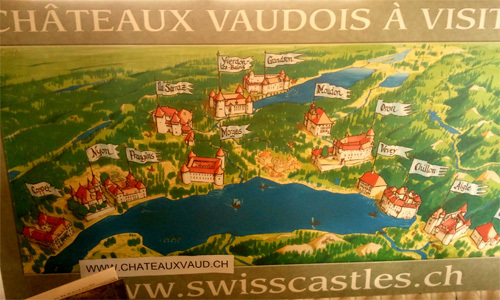 Switzerland is famous to be a pacific country. But they know war too. 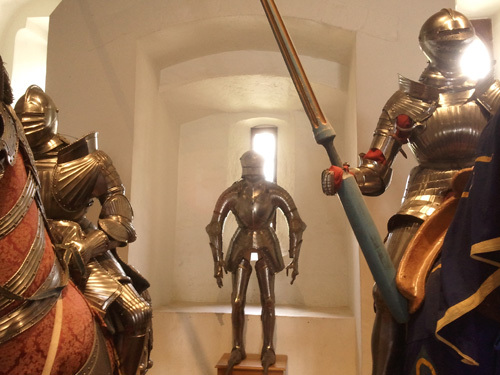 Inside Grandson and Morges castles we visited two museums about military history. Here I selected some photos about some interesting pieces. 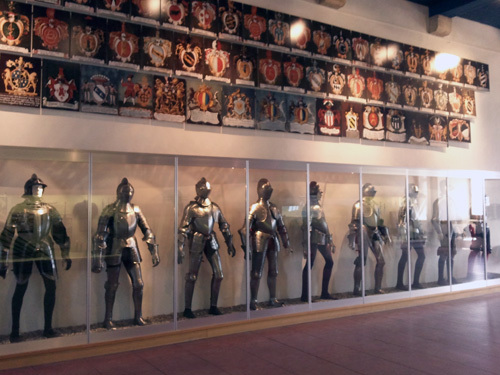 An armours row. Various types and countries. Heavy steel on horses, the tanks of the past. 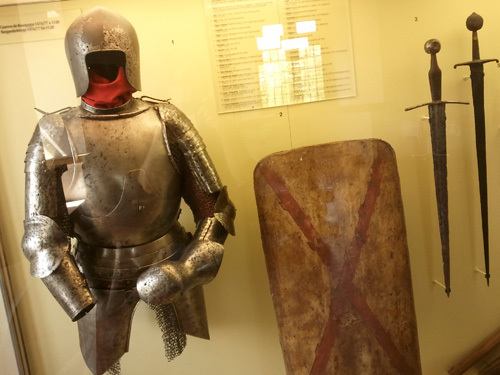 A Burgundian armour, sword and shield. 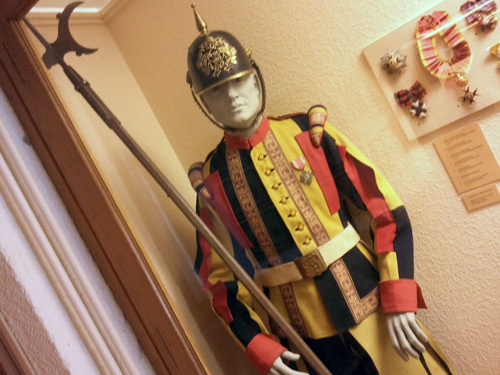 A Papal Swiss Guard uniform, the type before the actual one. 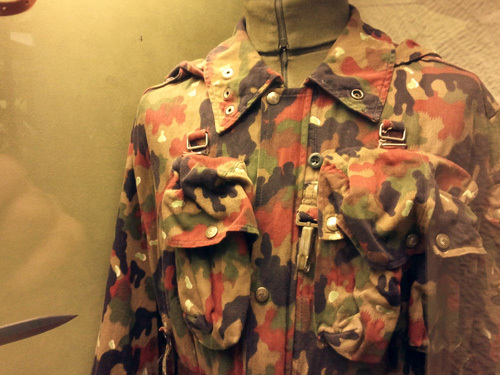 Swiss camouflage uniform. The pattern is very similar to the new Waffen-SS pattern of the 1945. 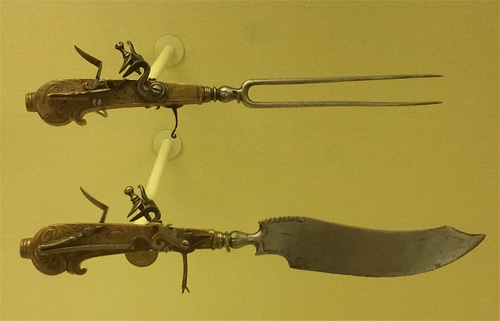 A revolver with a long, very long, barrel. Useless, I suppose. 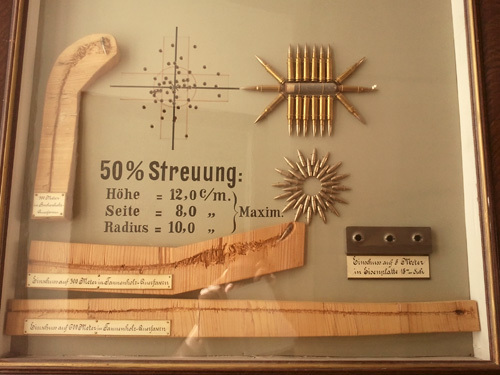 Penetration of a modern calibre bullet inside wood. 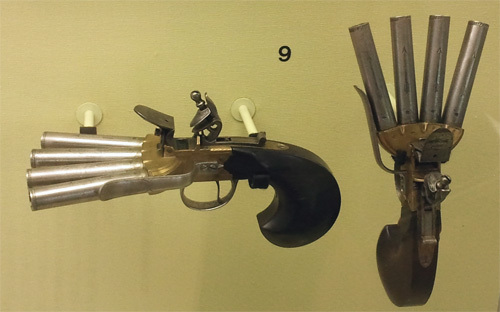 A quadruple barrel pistol. Barrage fire of a questionable usefulness. In Rome we have got a lot of towers, fortified high buildings where you could control the country around, so now some quarters are called with the towers names, like Torbellamonica (beautiful nun tower), Torrespaccata (split tower), Torpignattara (potter tower), Torre Gaia (gay tower), Torvergata (rodded tower) Torfiscale (fiscal tower), Tortreteste (three heads tower), and so on… but in this post we are speaking about Switzerland and they have got castles, and we visited some. 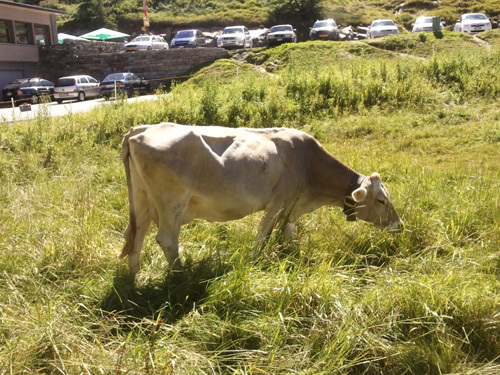 Swiss live among higher mountains so not many people went to disturb them. But to create more problems to strangers they built a lot of castles and now they are the centre of cities or villages. We went to visit museums inside them or we just went to do a walk in their surroundings. One thing that disappointed us a little was that these castles were essentially built for residential purposes than defensive ones. Or at least what we see today is their residential resettlement. 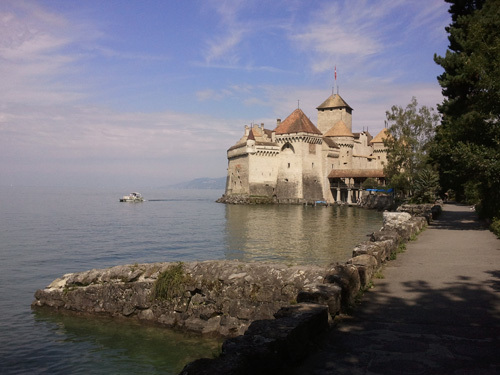 Chillon castle. Placed over a rock just off the shore of the lake, it has fortified walls against the shore side, while on the lake side there are the rooms for the landlord. 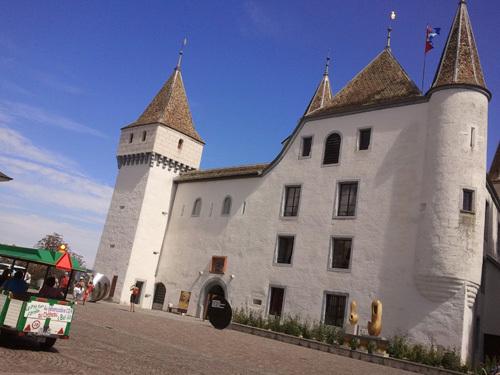 Nyon castle. You can go through to come out on a panoramic terrace above the city below. 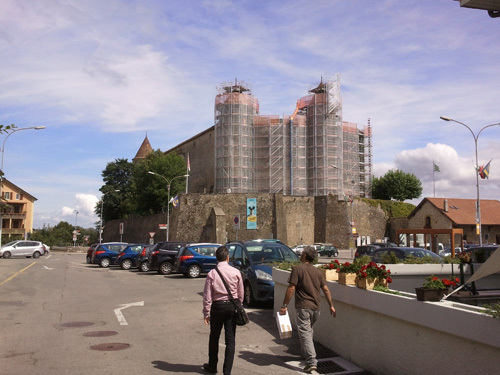 Neuchatel castle. Maybe now is the town hall. Grandson castle. Inside there is a museum about the Burgundian siege. And an exposition about comics and castles. 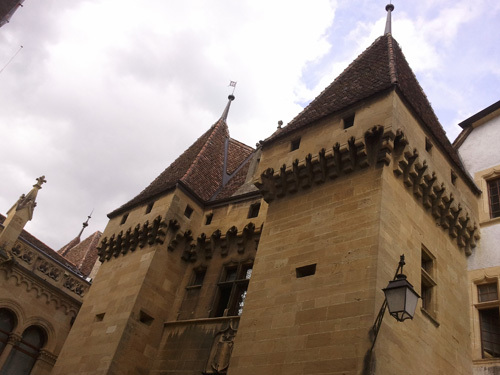 Morges castle. 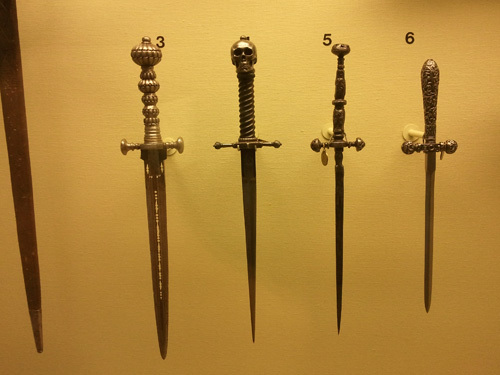 A weapon museum inside. I will show you something from here. Ouchy castle. By the lakeside of Lausanne. 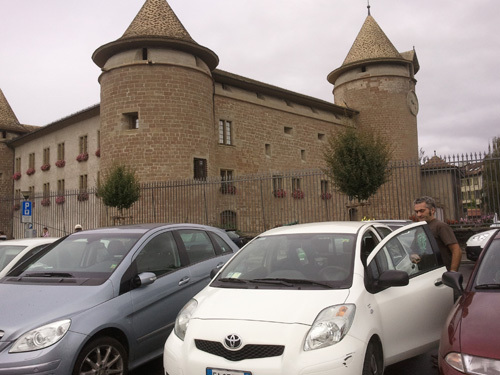 I haven’t a photo of the Prangis castle that we visited, so you can have one photo of me during the trip with the car, essential to visit all these castles. Summer holidays at last! 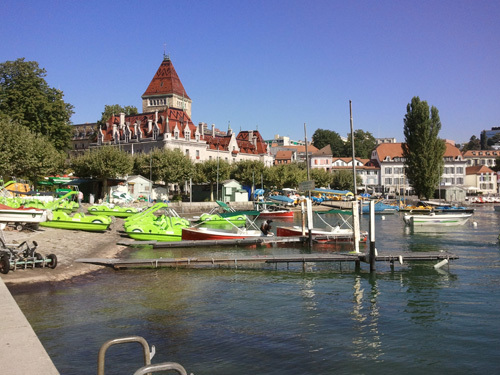 This time (9-17 August) I visited, together with my chaps Diego and Narciso, the Lac Léman & Lac de Neuchatel areas, the lakes at the South-East of Switzerland. 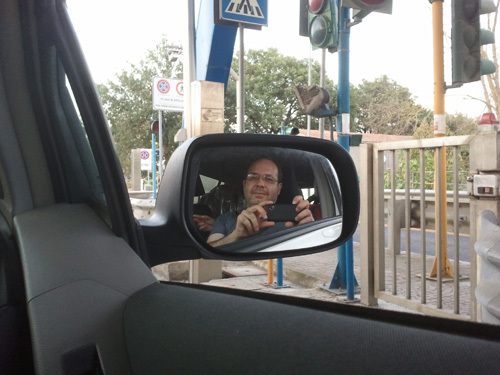 We travelled with Narciso’s car, a comfortable vehicle without air-conditioner but with lower-able side windows. A lot of km along the Swiss Alps, among cities in the middle of water and mountains. 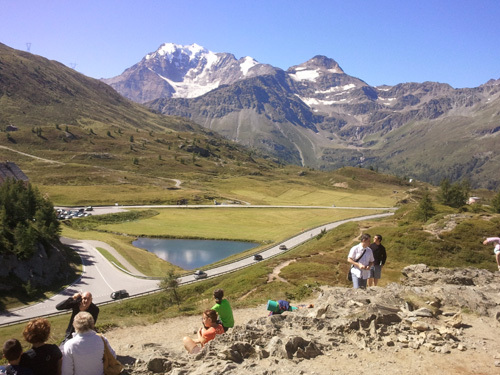 These photos are taken at the frontier with Italy, 2000 meters above sea level. 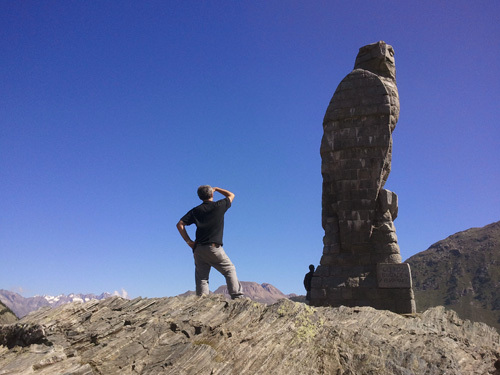 This eagle was built by Swiss soldiers during the WWII as a sentry towards us. I have got more photos but this is not the place for a lot of boring holiday souvenirs, as gay jokes at the Freddy Mercury statue in Montreux or our underwear portraits. But in the next posts I will show something interesting for you. However, why Switzerland this year? 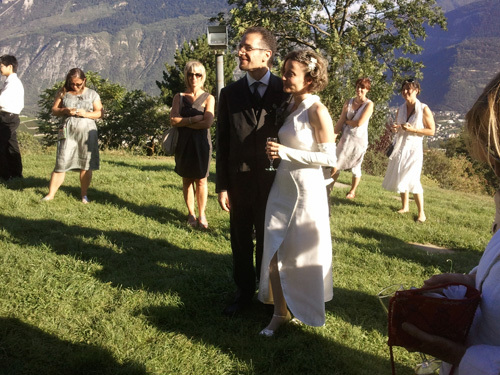 Because Paolo, our friend and founder of our Legio Palatina club, married a nice Swiss girl the 11th of August in a church near Sion. His brother, and Legio Palatina member, Luca was with us from London (we are an international club…). Happy marriage! I play with Lego since I was five years old. This shaped my way of thinking: everything needs order, a place in the flow of events, is part of a structure, and so on. For example, I refer to Lego bricks when I think about code blocks in programming. Or I think the simple lines of that blocks as the basic principles for interior design (yes, I like IKEA too). When I visited Legoland in Billund, I fulfilled a dream from my times as child. Moreover I like the minifigs and I think that they could be great miniature soldiers if they cost less, because they are fun, it is easy to change weapons and it is smooth to put them as dead on the ground. 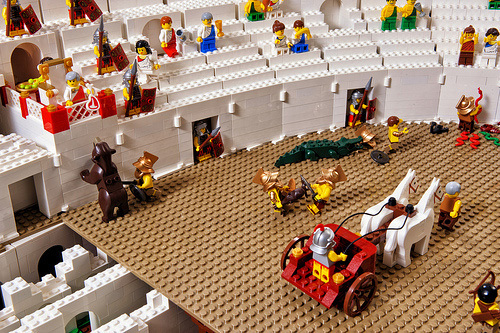 And buildings made of Lego bricks are ideal for damages done during the play. I have got only 6 minifig gladiators as miniatures for my wargames, I wish more. If you are a Lego modeller you are interested in building new and interesting things. 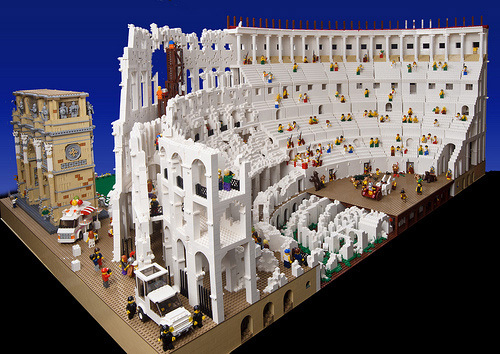 Ryan McNaught has thought to build a Lego Colosseum, a huge arena made of bricks white marble coloured. It is only a half of the entire ring, and as a quarter with the ancient look and the other quarter with the nowadays look. It is G-R-E-A-T. The elliptical form is a challenge to reproduce it by standard rectangular bricks. The real aspect of the current Colosseum is more dark red than white, but the ruins are well done. I would prefer an entire arena at the times of Emperor Traianus, but I can say that it is already enough so! Inside and outside are recreated some fun sketches to set the mood and liven up the model. Outside there are more things to view, with the modern part made of fake legionaries, illegal sellers of soft drinks, tourists and the Pope-mobile (!) with Emperor Palpatine as Pope Ratzinger (!!!) because they are almost twins in appearance. Only a question. I liked the Meta Sudans and the Arcus Constantini, but where is the real Colosseum, namely the Emperor Nero statue, outside the Amphitheatrum Flavium? He has forgotten it. Sun, beaches, heat, sweat, slices of watermelon,… it is Ferragosto time! This is the midsummer holiday and all is stopped. So you cannot have news about miniatures because it would not be in keeping with the mood of this moment of the year. Something else instead, some great music from Italy, some summer songs. I’m sorry that they are in Italian language but you can understand the same. Two examples of gangsta rap for you. Turn on the volume and have fun! If you like Gundam you can think to go to Japan to have some coffee in the Gundam Café. Have you understand? Yeah, a place where you can sit and talk with friends, surrounded by the epic deeds of giants robots manned by soldiers. It is a bit far, but it is the Gundam Café! The video shows a nice place, a little weird, but with an appeal on anime fans. If you look better, you can find that this place is not so nice, it is only a café with a LCD showing a Gundam video on rotation, a couple of glass cases with some plastic models out of the box, a cappuccino with a Haro sketch made of chocolate on the top (instead of the usual and more romantic heart), and some dishes with an uninviting appearance (toasted bread with oil and herbs and tomato sauce as side, and so on…) but with very little Gundam decorations. They could do something more. Viewing this longer videos you can better understand the topic. A theme restaurant built on a license so strong, but weak on the realisation. I can save to myself the trip to Japan. The best customised thing is the loo, where you can have a private Gundam experience. Last note: the loo is Federation for men and Zeon for women. Look here. 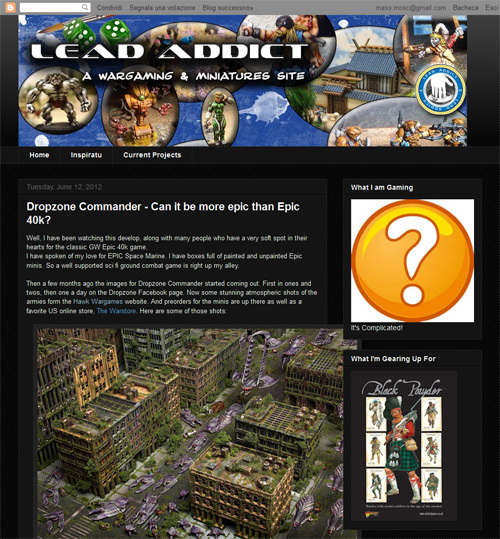 When I chose the name for this blog I liked the fact of recognising my hobby as an addiction, one addiction for miniatures, made of lead obviously. And lead is poisoning. Well, I thought to be quite original, with a distinctive name to sign my space, composed in a graphic form that reminds the style of a logo even if it is written only with a simple and standard font set. After a lot of surfing on the web I found now that someone had used the same concept for his blog. Here I show the other two blogs with a similar name to mine. And I want to remind you about the fashion blog L.E.addicted that I reviewed some posts ago.